Vlada RS je na seji 28.11.2012 izdala Uredbo o spremembah Uredbe o podporah električni energiji, proizvedeni iz obnovljivih virov energije. V Sloveniji je na omrežje skupno priključenih čez 210 MW fotovoltaičnih proizvodnih naprav. Predlog za spremembo Uredbe o podporah električni energiji, proizvedeni iz obnovljivih virov, prinaša spremembo višine podpor za fotovoltaične proizvodne naprave, ki bodo priključene na omrežje po 1.12.2012. Podpore bodo znižane za 63,89 % glede na referenčne stroške določene v letu 2009, ko se je začela izvajati podporna shema, kasneje se bodo po tej spremembi uredbe še mesečno zniževale za 2 %. Zaradi mesečnega zniževanja podpor za fotovoltaiko je določeno, katero višino referenčnih stroškov mora upoštevati agencija za energijo, ko odloča o upravičenosti do podpore. V Sloveniji se lahko postavi fotovoltaično proizvodno napravo do moči 50 kW že za 1350 EUR/kW (cena brez DDV). To pomeni, da je potrebno referenčne stroške določene v letu 2009 znižati za 63,89 %. Na osnovi več pobud, da se razdelijo proizvodne naprave v več razredov po moči in se na novo določijo referenčni stroški, ki so podlaga za podporo, je po novem določeno, da se za mikro fotovoltaične proizvodne naprave do 5 kW, ki so priključene za števcem v stavbi, doda bonus 5 % zaradi pozitivnega vpliva na omrežje, ki ga v takih primerih ni potrebno krepiti in razširjati. Sprememba podporne sheme bo imela učinek na proizvodne naprave, ki jih bodo investitorji priključili na omrežje po 1. 12. 2012. Po podatkih prejetih z Javne agencije RS za energijo so do 24. 10. 2012 skupno izdali deklaracije že za 190 MW fotovoltaičnih proizvodnih naprav, medtem ko je Akcijski načrt za obnovljivo energijo predvidel da bo konec leta 2020 v Sloveniji postavljenih za 139 MW fotovoltaičnih proizvodnih naprav. V Sloveniji je na omrežje skupno priključenih čez 210 MW fotovoltaičnih proizvodnih naprav. Intersolar Europe is again proving itself to be the world's largest, most international exhibition for the solar industry in 2012. Around 2,200 exhibitors are presenting their products and services across 170,000 sqm of exhibition space, spanning 15 halls of the New Munich Trade Fair Centre. From June 13–15, 2012, the international solar industry’s largest manufacturers, suppliers, distributors and service providers are convening to showcase the latest market developments and technical innovations at Intersolar Europe. With over 80,000 visitors from over 150 countries, the New Munich Trade Fair Centre will be the heart of the global solar industry for three days. Under the motto Connecting Solar Business, Intersolar Europe invites attendees to discuss new trends, forge international contacts in the industry and discover the latest technologies and solutions that the industry has to offer. Energy Efficiency & RES Exhibition for SE Europe (Int'l Exhibition on Energy Efficiency and Renewable Energy Sources) takes place in Sofia, Bulgaria from 28.03 to 30.03.12 at Inter Expo Center Sofia. Trade show is organized by Via Expo. The organizer Via Expo expects over 7 000 professional visitors to get involved. Denver-based New Town Builders have created a net zero energy house that has designed to save a lot of energy and help preserve precious resource. The Zero Energy Home will leave eco lovers in a state of complete amazement as it takes energy efficiency to an all new scale. The builders kept in mind a few things while coming up with this environmentally friendly home. The basic frame of each home will be swapped into an insulating envelop. The roof will come wedged with photovoltaic electricity generating system, which will power the house. This makes sure that the outside cold is completely blocked, and the inside remains comfortable for dwellers. The water heaters, furnaces and air conditioners are highly efficient, which adds to its clean and green status. The construction style makes sure that seven percent or less cooled/heated air gets lost, thanks to the heating and air conditioning ducts used that will be tightened from time to time. The Zero Energy Home will easily produce the amount of energy it utilizes in a year's span, which can be measured with the help of HERS rating or Home Energy Rating System. The Zero Energy Home will have a zero HERS rating, which is worth applauding. The home will be as comfortable and attention grabbing as an everyday home and will simultaneously be cost effective as well. It won’t burden owners with unusual or complex systems that require regular maintenance and monitoring. The outside wall of the eco coated home will be well sealed and insulated so that no energy escapes. This will be achieved by spraying foam having a thickness of 1 inch. The windows will have a decreased U value because of which they will become all the more energy efficient. The house will have energy star appliances, keeping up its efficiency. It will feature a 16 SEER or improved air conditioning system, furnace, tank less water heaters, a fresh air ventilator and an energy recovery exhaust fan. The house will sparkle with the presence of 100% LED and CFL lights, which will further save energy. Additional kilowatts of energy will be generated by the presence of extra photovoltaic panels. So, save energy and live a guilt free life while cutting down on your electricity and gas bills. Even with changes to the feed-in tariff that have reduced solar photovoltaic installations compared with previous boom years, the sector was still the fastest growing among all other renewable energy sectors in 2011, according to preliminary figures. This follows data released last week showing that renewable energy accounted for 19.9 percent of electricity production in the country in 2011, growing 16.4 percent over 2010. Meanwhile, overall energy use in the country fell 4.8% due to warmer temperatures and increasing efficiency efforts, further boosting the value of solar generation. The world's largest social networking site recently announced plans to utilize more renewable energy to power it's new Menlo Park, Calif., headquarters. Last year, Facebook was scrutinized by its users for using coal to supply the energy for its massive data centers. The company responded by reminding the public that power for its newest data center would come from multiple sources, including renewables, and would be one of the most energy efficient in the world. But it's clear that some of that negative attention made an impact on Facebook decision makers. "Cogenra's technology is designed to use energy that other solar set-ups waste. 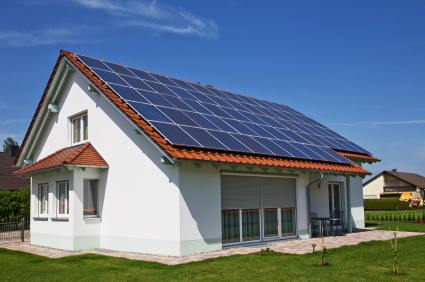 Photovoltaic panels absorb a small fraction of the energy the sun throws at them, typically 15 to 20 percent. The rest is wasted as heat. Cogenra arrays, however, run fluid-filled tubes behind the solar cells, with the fluid absorbing some of the heat cast off by the cells. The fluid - a chemical compound kept in a sealed loop - then transfers the heat to water. Curved troughs of mirrors concentrate sunlight on the cells, while motors keep the troughs pointed at the sun as it arcs across the sky." The solar system will only be able to generate about 10 kw of electricity and 50 kw of thermal energy, which makes it fairly small as far as commercial arrays are concerned. But Facebook director of global facilities John Tenanes said the company could later expand the system, perhaps using the hot water in on-campus cafes. He described the Cogenra system as Facebook’s initial investment in solar power. Since Facebook shows no signs of slowing down any time soon, we applaud them for this small but significant first step. We only wish more mega-corps viewed renewable energy as an investment instead of a burden. The 1 millionth solar PV system installation milestone has been declared by the German Solar Industry Association (BSW-Solar). Having launched the 1,000 rooftop program in late 1990, its now just over a decade that a system on the roof of the Institute for Sports Equipment Research and Development (Institut für Forschung und Entwicklung von Sportgeräten - FES), in Berlin marked the 1,000,000th system installed in Germany. In contrast, London, England has over 3 million homes but only just over 3,000 installations since the feed-in tariff was introduced in April, 2010. BSW-Solar reiterated that it expected approximately 5GW of new installations in 2011, generating a cumulative installed base of approximately 22GW by year end. The industry trade association noted that PV in Germany covers approximately 3% of gross electricity consumption, but expects this to have reach 10% by 2020. The current world scenario demands sustainable and Eco-friendly architecture so that we, the citizens of the world, can benefit from them in the future. With similar thoughts, certain architectural designs have been created that stand out as wonderful examples of sustainable architecture. 10 such examples of sustainable architecture are listed here for your information. The Solar Plaza Fargo, a mega project in North Dakota in USA, is a great example of sustainable architectural development. This project, built on a sprawling site area of 90,000 sq. ft., has a large solar panel surface in it that's covered by a glass layer. The project houses both residential and commercial use structures. A lot of use of glass has been made in the construction of the structure so as to let natural sunlight enter the interiors of the buildings. The design of the project encourages and allows space for plantations, sun dial and a central fountain.The parametric design helps to harness solar power through the frameless PV solar panels. This makes Solar Plaza Fargo capable of producing 70,000kWh units per month which totals to 850,000kWh units per year which is around half of the total requirement of the project. The designer of Charleston, Mathew David Wagner, is a professor at Virginia Tech's School of Architecture & Design who believes in the creation of eco-friendly structures. The design of Charleston includes a group of independent structures that are meant to be used as gathering spaces for different outdoor activities which actually are done indoors. Charleston also includes a range of sustainable elements that boost green practices such as provision for storing storm water, exploitation of natural light, cross ventilation, appropriate shading and high albedo surfaces. The CCHR or Center for Civil and Human Rights in Atlanta in Georgia, designed by Antoine Predock Architect in collaboration with Moody - Nolan and Perdock Frane, boasts of sustainable architecture that includes green roof and photovoltaic cells. The roof garden works as the cooling system of the building while the photovoltaic panels are fitted at the most beneficial solar orientation. The architecture of this building also includes various other Eco-friendly features like holding and filtering rain water. The design of the building aims at fossil fuel consumption reduction, utilization of the mass of the earth for heat exchange and introduction of fresh air. Cascadia Center for Sustainable Design and Construction, Bullitt foundation's new headquarters, is supposedly the most sustainable design for a commercial building in the world. To be set up in North America, the design includes a photovoltaic power plant which is to generate all the needed power for the building. Not only that, the architecture will also include a 50,000 gallon reservoir that will collect rainwater which then will be treated so that it is suitable for consumption. Lycee Jean Moulin is a school in Revin in France that has been built following green practices. The design developed by OFF Architecture along with Jeans Giacinto and Duncan Lewis Scape Architecture is so off-beat that from a distance it is difficult to locate the structure of the building as it blends so well with green landscape of the hilly location. The terraces of the school are layered by grass and therefore do not break the beautiful, natural, green look of the hills. Named as the Eco Link project and designed by architects like Junkai Jian and Jinqi Huang, this is a huge passenger terminal building that is located on a river side. The structure designed in an asymmetrical form with a sloping demeanor allows a lot of natural light inside the building. The building's design allows rainwater harvesting that can be used to meet the water requirement of the irrigation and other plantations and vegetation which are located inside the compound of the structure. The project has solar panels in its roofs that would generate solar power to meet the power requirement of the project. This design created for a new Fine arts center to be set up in Helwan in Egypt is a great example of sustainable architecture. The designer, Moatesem Esmat of Mataria Engineering School, has included various green features in this brilliant, futuristic design. While wind and solar energy would be used to power the premises of this fine arts center, provision for rain harvesting has also been looked into. A lot of the place of this design is covered by greenery and the places that are to be used as courtyards include mechanism so as to allow natural light and ventilation. Apart from being an astonishingly beautiful creation, this flower-shaped building designed by Grontmij and Soeters Van Eldonk Architects hosts a lot of efficiently used green features like rainwater harvesting, solar panels attached to the roofs, solar chimney etc. While rainwater harvesting and solar power generated through solar panels help to meet the water and power requirement of the building, solar chimney in the middle of the structure helps to maximize natural ventilation. The rim around the bowl functions as a sunroof and helps to heat and cool the structure. The pistil made in vertical axis wind turbines collect renewable energy for the building. This design is the first one in the entire world to be accredited by the BREEM outstanding award. The Taiwan Tower, designed by STL Architects, is the tallest structure in the city of Taichung. This circular tower has been designed to resist the force of wind along with making the most of renewable sources of energy. The architecture of this structure eliminates the need of mechanical cooling or heating of the building thus saving a large quantity of energy. The central part of the tower is lighter and holds lesser material while saving more of energy. Named UCN IMAGO, this educational complex designed for University College Nordjylland is a sustainable architectural design created by GPP architects. To be set up in Aalborg in Denmark, the design consists of four buildings around a common space. The design has been planned considering the impact on the environment and therefore the entire concept surrounds around energy efficiency. The architects plan to use solar power to meet the energy requirement of the buildings while making the balconies and overhangs of the common central space act as green sunshades. The Chinatrust Bank complex located in Taiwan is an eco friendly structure because it features green roofs. LA office of NBBJ has designed this beautiful skyscraper together with Taiwanese firm Fei & Cheng Associates. This 30-story complex features 21-story commercial office building and 10-story hotel. It is expected that by 2012 the whole structure would cover around 2.5 million square feet. The building has been designed to use the natural site and solar energy to generate energy. The gardens on the roof of this building will reduce rainwater runoff. Designed by Brazilian architect Felipe Campolina, this futuristic skyscraper with green wall and roof is made of several mobile living units. The living units of this building are scaled from the standard OSB plate and steel frame structure makes up the mobile living units. The wall features thermo-acoustic insulation and the tower features rails on each floor. Six independent units are carried by each floor. The units have been designed in such a manner that they can be added or removed without disturbing the neighboring unit. The building has a water recycling system as well. American company Perkins Eastman recently unveiled two skyscraper designs made especially for the Indian city of Mumbai. The designs of these green skyscrapers were showcased during the Kohinoor Skyscraper Competition. In the first design, Perkins Eastman has suggested to build a 108,000-square meter structure. This 33-story building features a double story retail base. In its second design, the American firm has proposed to build two mid-rise buildings of 66,700 square meters each. These eco friendly towers will generate electricity using renewable sources of energy. The roofs of the buildings will have gardens. Spanish firm Nabito Architects has proposed to build a unique skyscraper named “Stairscraper” in Abu Dhabi, UAE. The firm claims that this green building would allow the occupants to feel the joy of suburban life while living here. Each apartment of this building will have a roof which will be used as the garden. Each unit in this skyscraper will have private outdoor space, which will allow the occupants to grow their own garden. UK-based architect Ken Yeang deserves credit for designing a green skyscraper named Fusionopolis. He claims that it is the first truly green building in the world. Fusionopolis will be built in Singapore. This 15-story structure features a vertical spine of planting on each floor. Each floor of this building has got landscaped garden terraces. This green skyscraper will use natural sources like sun to generate energy. Sears Tower, the tallest skyscraper in the US, is set to get a green makeover worth $350 million. It is expected that the makeover would reduce the electricity of this 4.5 million square feet building by 80% and save 24 million gallons of water annually. Sears Tower contains 104 elevators and 16,000 windows and it is likely that this huge structure would earn LEED certification in near future. As part of the makeover, the roof of the building will get solar panels and wind turbines. Around 35,000 square feet of roof will be converted into garden. The “Hyper-Tower” is the brainchild of French architect Jaubert Francois. This twin-tower set up has space for residential apartments, commercial purposes and sports events as well. A vertical park starting at the ground floor connects the two towers. The park finishes on the roof of this building at a football pitch. This green tower has sports and residential facilities on the upper levels while offices, shops and restaurants are on the lower levels. San Francisco-based designer Joanna Borek-Clement deserves credit for conceptualizing the idea of the Sky-Terra skyscrapers. The whole structure is infact a network of interconnected towers. This floating green structure features parks, gardens, fields, pools, etc. The height of the tower made from modular parts can be as much as 1,600 ft.
Aesthetics architects GO Group has designed this cactus-inspired energy-efficient structure for Qatari government. This building features several smart shades that open and close according to the sun’s strength. This green building has a botanic dome as well. Danish firm MVRDV has designed a green building for Rødovre, a Danish municipality, in partnership with ADEPT. Named "Sky Village," this 381 feet building will have residential space, offices, hotel and park. The design of this eco friendly building is based on "pixels," which are flexible and measuring 646 square feet each. Going green and promoting sustainability is one of the top priorities in today’s world. When we talk about interiors and architecture, architects and interior designers from all around the world are designing highly engineered structures that combine various sustainable features. The new inventions haven’t spared the sports stadiums as well. Lately, we have witnessed eco-friendly sports stadiums being designed in various cities in the world. The solar powered sports stadiums are perfect example of going green. Further in this post you will read about the five best solar powered sports stadium in the world. This futuristic looking sports stadium has the honor of being the first stadium in the world to produce its own electricity. Dragon Stadium uses the power of the sun and provides itself with enough electricity supply. The stadium is designed in horse shoe-shaped and is located in Kaohsiung, Taiwan. This stadium has been built for the World Games and is the first sports stadium to use only solar power technology. This huge 19 hectare structure boosts a seating capacity of 55,000 viewers and will be used specially for rugby events and athletics. The innovative steel rod structure for the roof, which sports the solar panels, has been designed by a Japanese architect Toyo. The unusual semi-spiral shape takes its inspiration from a dragon. The Stade de Suisse was earlier known as the Wankdorf Stadium, and is located in Bern, Switzerland. This brand new, hi-tech stadium has a seating capacity of 32,000 viewers to enjoy fantastic football and outdoor ice hockey! The old Wankdorf Stadium was replaced by the modern Stade de Suisse in the year 2005, and the earlier stadium was demolished in the year 2001. The state of art stadium has installed 7,930 solar modules and produces 1,346.774 kWp electricity. The stadium has been honored with both the European and Swiss Solar Awards for the integration of the photovoltaic plant. AT&T Park is one of the most popular ballparks located in California and serves as the home to the major league baseball giants in San Francisco. Originally it was known as Pacific Bell Park, with a seating capacity of 42,000 viewers. However, in the final design major modifications were done, and with an expenditure of more than $357 million, the multi-use stadium was constructed. The revamped stadium was reopened in March 31, 2000, and was the only Major League ballpark that was constructed without public funds. The stadium was opened with a seating capacity of 40,800 viewers; however it has been increased with passing years. The stadium sports 68 luxury suites, 1,500 club seats at the field level and 5,200 club seats at the club level. Easy Credit Stadium was one of the most important venues in Nuremberg for the Football World Cup 2006. It is located in Volkspark Dutzendteic and boosts a history of 80 years. Earlier, it was a municipal stadium that was completed in the year 1928, and boasted some exceptional architectural features. The stadium area with its surrounding area was awarded a gold medal for its artistic design. Easy Credit Stadium was equipped with a solar power system in the year 2006. The solar system was installed on the roof of the stadium and provides 140 kWh of electricity every year. The stadium has the seating capacity of 48,500. Few of the facilities available at the stadium are changing rooms for coaches, players, and referees. It also has a physician and treatment room. A 300 sq m press area is used for press conferences, which 1200 sq m area is reserved as a VIP area and sports rooms for almost 800 guests. Fenway Park is one of the most popular baseball parks in the world. It is locate in Boston. It is also known as a home ballpark to the world renowned Boston Red Sox baseball club. It is one of the oldest Major League Baseball stadiums that are currently in use. This stadium was opened in the year 1912, and has received several makeovers. The latest makeover took place in the year 2008, which led to the installation of the solar panels on the roof of the stadium. The electricity produced by these solar panels provides more than 37 per cent of the stadium’s hot water. The stadium was constructed with a cost of almost US $650,000. The seating capacity of the stadium for the day events is 37,000, while for the night event is 37,500.